Everyone is talking about social media and abbreviations such as FB are now common terms. By 2014, 164.9 million US users are predicted to be regular social media sites (eMarketer report), and a similar upward trend in the growth of social media users worldwide will take place. However, how do entrepreneurs and business owners use social media as part of their online marketing strategy and how can you turn this into actual sales? 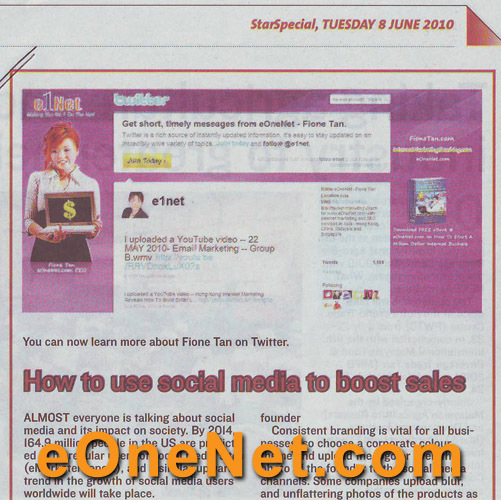 In this issue, Fione Tan, CEO of ten year old internet marketing company - www.eOneNet.com and multi-millionaire Internet Marketing Coach who sells a variety of B2B, B2C, services and even digital products on the Internet, shares 4 simple tips on how you can integrate Social Media into your business. Majority of popular online sites have added these icons to their website and you should do the same. For example, www.FioneTan.com where we have added icons of Facebook, Twitter, Youtube and even the link to our internet marketing blog. Those icons should not just be shown on your site, but it should be hyperlinked to your direct account e.g., the link for YouTube will link to our internet marketing videos channel at www.YouTube.com/e1net and not to the home page of YouTube. If you have retail outlet or company brochures, you can also add in the web address of your social media accounts with a simple message such as Visit us at www.Facebook.com/eOneNet in your printed materials. Consistent branding is vital for all businesses, therefore choose the corporate colour theme and upload the logo or even the photo of the founder to the social media channels. It’s surprising to see some companies upload blur, and unflattering photos of the products as the icon of their social media account. It might be the first time the prospect has seen your brand and such photos will make your company seem unprofessional. These pages should also be customised with your own design to create a lasting impression to your brand. The best thing about social media is that a majority of them are free! Therefore, nearly anyone can start promoting via social media. The main issue is how to run a successful social media marketing campaign and managing these new platforms as it has become very competitive. If you are interested to start your own Internet Business, or want to create more sales for your Company via social media marketing online, you are encouraged to check out the bestselling Half day Web 2.0 Internet Seminar to learn How to Boost Your Website Traffic and Sales Revenue with Social Media and FREE Top Search Engines Rankings. These eOneNet courses are available in English and Chinese and available at various cities in Malaysia. Register for the seminars valued at RM98, at the special price of only RM38 by using the promo code Star38 when you remit the online credit card payment. All seminar dates are listed at www.eOneNet.com and you can call +603-2284 6418 / +6012-232 8878 to reserve your seats now! For details on seminar dates, visit www.eOneNet.com or subscribe to free internet marketing news at www.InternetMarketingBlog.com. 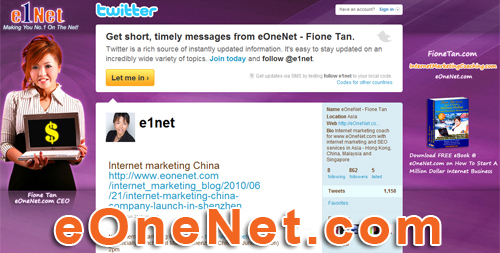 Alternatively, follow eOneNet news at www.twitter.com/eonenet .